The Great Blue Heron Weather Vane with Nest, Ardea herodias, featured here is a variation on our Flying Great Blue Heron Weathervane. 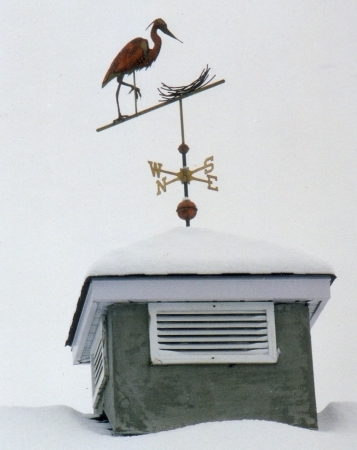 This weathervane depicts the heron building its nest. Popular ways to make this weathervane are entirely in copper, in a combination of copper and brass or adding optional gold leaf to the heron’s beak, plume and legs. As the copper weathers a deep chocolate brown, the gold leafed accents will retain their warm golden color creating a dramatic visual contrast between the two metals. 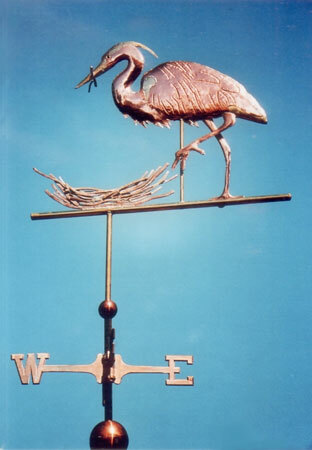 A favorite story about one of these weather vanes involved a young couple in the Seattle area. We were showing our work at an art festival in the area and they ordered a small (one-foot) Great Blue Heron Weathervane to put on a deck railing overlooking an estuary behind their house where they frequently see herons wading, fishing or flying. As they were placing their order, we told them about a very special tradition involving ‘lucky’ pennies in weathervanes. The original Victorian tradition, and one we follow with all of our vanes, was to include a penny from the year the weather vane was made inside the sculpture piece. Because copper is non-ferrous, weathervanes still exist today that were created over one hundred years ago, and some of them have Indian head pennies inside. The couple’s three little boys were very excited about the ‘lucky’ pennies. We all checked our pockets for pennies and, amazingly, found one from the year each boy was born. They held their ‘lucky’ pennies in their hands and made wishes on them. When we made their weathervane, those special pennies ended up in three little eggs in the heron’s nest.